Rail transport had its best week in over a month, after it had turned negative for three recent weeks. The Harpex index continues to improve slowly from its January 1 low of 352, and the Baltic Dry Index remains above its recent low. Gallup's YoY comparisons have been very positive since last December. They got less positive in the early part of April, but have rebounded again, and this week had one of the most positive comparisons all year. The ICSC varied between +1.5% and +4.5% YoY in 2012. 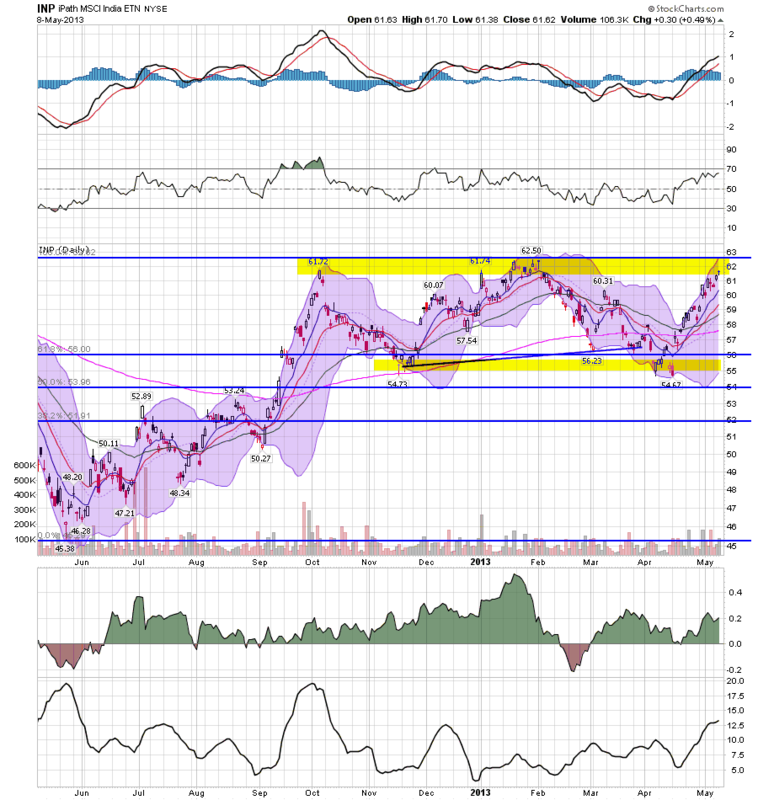 In the past two weeks it has rebounded from prior results near the bottom of this range. The JR report this week also rebounded the upper part of its typical YoY range for the last year. Initial claims established a new lower bound to their recent range of between 330,000 to 375,000. The spring increase of the last two years has not materialized this year. The ASA is still running slighty below 2007, but now essentially unchanged from last year as well. In other words, the comparison has been generally deteriorating on a YoY basis. $130.5 B (adjusted for 2013 payroll tax withholding changes) vs. $135.1 B, or -3.4% YoY for the last 20 days. The unadjusted result was $151.5 B for a 12.4% increase. $56.2 B was collected for the first 7 days of May vs. $50.0 B unadjusted in 2012, a $6.2 B or a +12.4% increase YoY. These are very good YoY comparisons compared with the last three months. While my best estimate is that collections should be up 15% due to the payroll tax increases that took effect on January 1, that appears not to be accurate, so now that we have enough data from this year I am making comparisons with earlier this year, and this week's comparison is one of the two best. Housing prices bottomed at the end of November 2011 on Housing Tracker, and averaged an increase of +2.0% to +2.5% YoY during 2012. This weeks's YoY increase makes a new 6 year record. This year purchase applications have finally established a slightly rising trend, and this week's number was the best in 3 years. Refinancing applications were very high for most of last year with record low mortgage rates, but decreased slightly since then. Nevertheless this was the best week for refinancing in 5 months. Interest rates for corporate bonds have generally been falling since being just above 6% two years ago in January 2011, hitting a low of 4.46% in November 2012. Treasuries have fallen from about 2% in late 2011 to a low of 1.47% in July 2012. Spreads have varied between a high over 3.4% in June 2011 to a low under 2.75% in October 2012. The last several months saw a marked increase in rates and credit spreads widened, followed by a reversal in the last few weeks. The price of a gallon of gas, after declining sharply in March and April, has risen slightly in May. The 4 week average for gas usage remained negative after previously spending nine weeks in a row being positive YoY. After months of gradual deterioration, there were absolutely NO negatives in the weekly indicators this past week. The closest were several positive but deteriorating indicators: temp services are barely above last year, and Oil and gas prices have started climbing again, with less gas usage. Bond spreads were neutral. Commodities were muted. Positives included house prices, and both purchase and refinancing mortgage applications. Initial claims continued their terrific recent run. Money supply was positive. Overnight bank rates are somnolent. Consumer spending as mesured by same store sales is decent. Gallup consumer spending continues on a tear. Rail traffic had the best week in over a month. Even tax withholding, when compared with its adjusted YoY results over the last four months, had its best comparative weekly result yet. This is about as good a weekly batch of statistics as could be hoped for, and I'll take it. Have a nice weekend. It's been a really slow news week, so now is a good time to step back and update a look at the long leading trends In the economy. These are the four long leading indicators Prof. Geoffrey Moore identified in the 1990's just before he founded ECRI. Each of these tends to peak more than one year before the economy as a whole does, and in particular before industrial production, spending, and payrolls turn. In the graphs below, the last 5 years for each indicator - housing permits, corporate profits, real M2 money supply, and yields on BAA corporate bonds (inverted) are shown in blue, with the last 18 months highlighted in red. Corporate profits have risen to all time highs. Real M2 did fall into the recession warning area in 2010 and early 2011, but that signal is now waning. 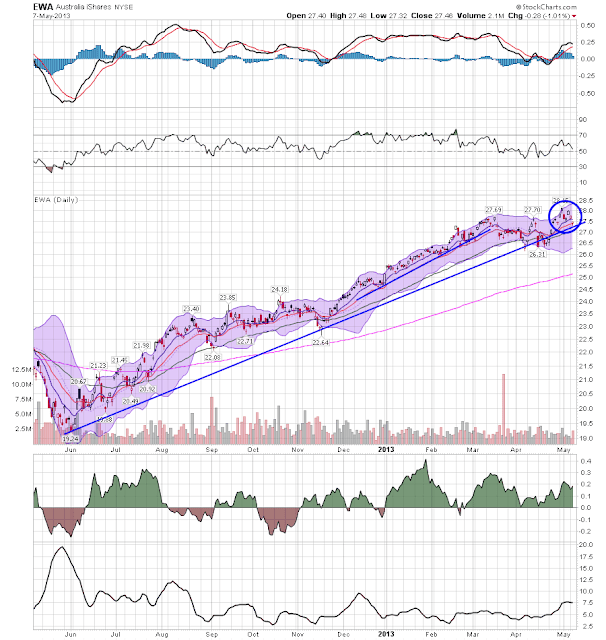 Here again the rising signal is unambiguously positive. In summary all four long leading indicators signal that, left to its own devices (i.e., without idiotic austerity imposed by Washington), the economy and with it payrolls and consumer spending, should continue to be positive this year. Despite the above, there are two very big flies in the ointment. The first, of course, is that Washington hasn't left the economy to its own devices. Consumers have been forced to stump up an additional 2% of their pay due to the expiration of the payroll tax cut; and austerity via sequestration has been added on top of that. The two times in the past when many leading indicators gave the least warning is when the Arab oil embargo was imposed in late 1973 and the economy almost immediately went into recession; and when the recovery from the 1980 recession was strangled by the Fed's sharp and abrupt increase in interest rates. The real personal savings rate tends to be a very long leading indicator. It can remain low for a long period of time, but once consumers worry that the must save more, a recession typically occurs. Both warnings from this indicator have been triggered - it has fallen more than 5%, and it is close to zero. The increase that began 18 months ago is probably feeding through the economy now. While none of the other long leading indicators have rolled over, several - permits, Baa corporates - have hit soft spots, and bear watching more closely. I'm on the last day of a two week travel fest, moving from San Francisco last week to New Jersey this week. To put it simply, I'm beat. Regular blogging will start back up on Monday. NDD will be here this weekend. Continuing my look at recent central bank action that occurred during my absence, we have the EU dropping its rate from 75BP to 50BP. The reason is simple: the region is still in a recession with the numbers being reported getting worse. 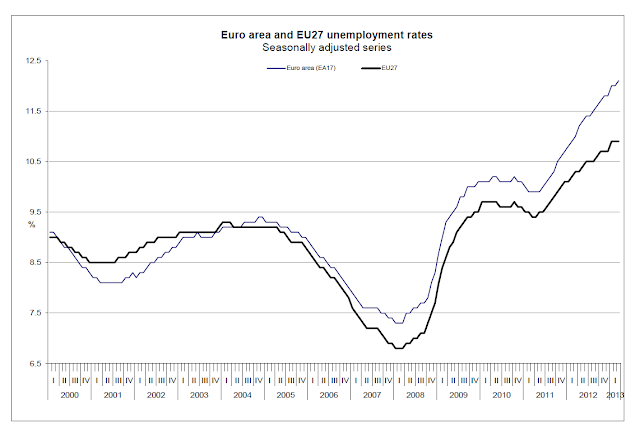 The euro area1 (EA17) seasonally-adjusted2 unemployment rate3 was 12.1% in March 2013, up from 12.0% in February4. The EU271 unemployment rate was 10.9%, stable compared with February4. In both zones, rates have risen markedly compared with March 2012, when they were 11.0% and 10.3% respectively. These figures are published by Eurostat, the statistical office of the European Union. Starting in the 1Q12, we see the unemployment rate start to tick up consistently. Also notice how there has been absolutely no pause in the rise. This alone would be of concern to any central bank. But the news continues to get worse. 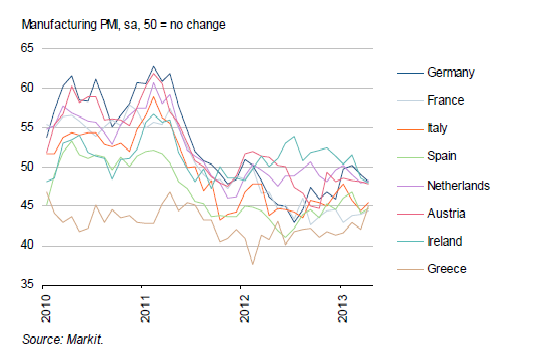 All the major economies are now below 50. Some have been at that level for over a year, indicating a prolonged contraction. 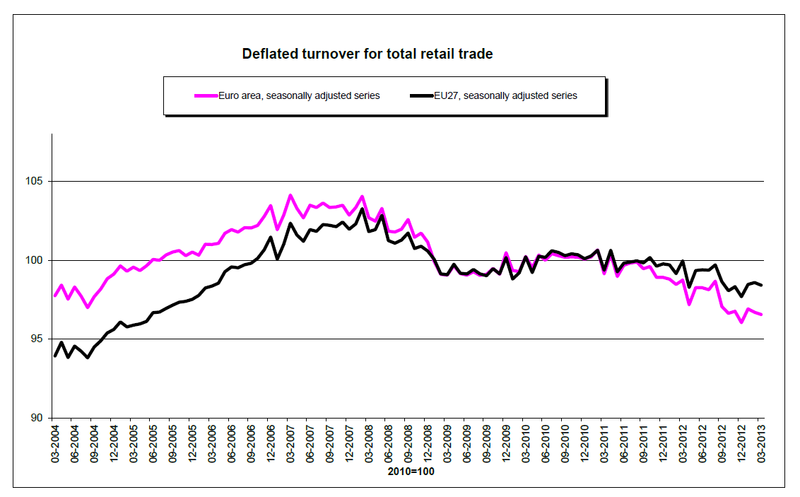 In March 2013 compared with February 2013, the volume of retail trade1 fell by 0.1% in the euro area2 (EA17) and by 0.2% in the EU272, according to estimates from Eurostat, the statistical office of the European Union. 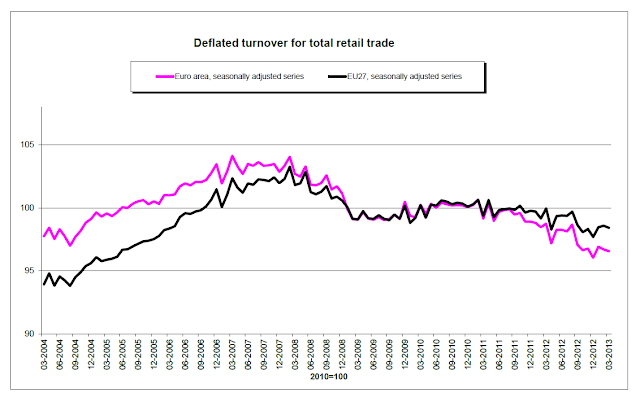 In February3 retail trade decreased by 0.2% in the euro area, but rose by 0.1% in the EU27. 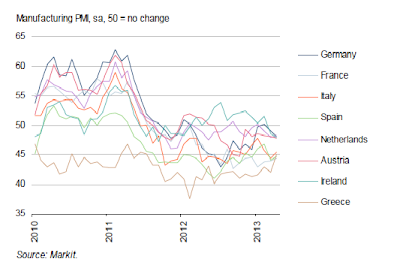 Simply put, the EU remains mired in recession with little to no indication of getting out anytime soon. For the second week in a row, initial jobless claims were under 330,000, at 323,000. Furthermore, the 4 week average, at 336,750, is only 750 above what I consider a population-adjusted normal expansionary range. The 4 week average is also the lowest since November 2007, before the onset of the great recession. Should next week's number be below 350,000, that ought to be enough to move the 4 week average under 336,000. If Atrios calls this "good news," I think we are officially there. I've written previously that I'm bearish on the Indian economy (see here and here). They're got numerous problems -- an incredibly poor infrastructure, a terribly bloated and inefficient government, lower overall growth and high inflation. All in all, it's not a very promising picture from a short or medium term perspective, barring a big change in the way the government regularly goes about its business. 10. Today’s decision to further cut the repo rate carries forward the measures put in place since January last year towards supporting growth in the face of gradual moderation of headline inflation. Nevertheless, it is important to note that recent monetary policy action, by itself, cannot revive growth. It needs to be supplemented by efforts towards easing the supply bottlenecks, improving governance and stepping up public investment, alongside continuing commitment to fiscal consolidation. Translating out of central bank speak we get the following points. We're doing our part to help the economy. But we can't do it alone. It would be really nice if the government would change the way it goes about setting policy. Inflation is still a really big problem and it limits our ability to continue lowering rates. 17. The Central Statistics Office (CSO) put out the advance estimate of GDP growth for last year, 2012-13, of 5.0 per cent, lower than the Reserve Bank’s January 2013 baseline projection of 5.5 per cent. The CSO’s lower estimate reflects slower than expected growth in both industry and services. 18. Looking ahead, economic activity during the current year is expected to show only a modest improvement over last year, with a pick-up likely only in the second half of the year. Agricultural growth could return to trend levels if the monsoon is normal as recently forecast. The outlook for industrial activity remains subdued because the pipeline of new investment has dried up and existing projects remain stalled by bottlenecks and implementation gaps. Growth in services and exports may remain sluggish too, given that global growth is unlikely to improve significantly from 2012. Accordingly, the Reserve Bank’s baseline projection of GDP growth for 2013-14 is 5.7 per cent. Notice that growth is slowing down. This is due to both internal and external factors. Also note the internal factors are difficult to change, implying we'll see these problems continue for the foreseeable future. The slowdown is broad based and has a diverse set of causes, making a change in policy difficult. 24. In the Reserve Bank’s assessment, WPI inflation is expected to be range-bound around 5.5 per cent during 2013-14. This assessment factors in the domestic demand-supply balance, the outlook for global commodity prices and the forecast of a normal monsoon. Notice how non-core inflation (food and energy) is starting to bleed into core inflation -- notice the description of inflation as "sticky" in point number 23. This would be a great concern to any central bank and is a primary reason why the bank doesn't have a great deal of room to lower rates further. The chart really hasn't meaningfully moved in the last 6 months, trading between 55 and 62 -- a roughly 11% range. Over that time frame, we've seen very little meaningful movement in the MACD which has been flat for a majority of the time. Volume flow into the ETF is still positive, however. Obviously a break about 62 or below 55 would be the key developments to this chart moving forward. Are affluent democrats boosting the economy? Hey all -- this is Bonddad. I'm back after vacation. First, many thanks to NDD for the fine work he did while I and the Bondspouse vacated in San Francisco for a week. During my time off, there was plenty of economic news which I'll be catching up on. Let's start with some of the big news from yesterday -- Australia's dropping its rates 25 basis points. 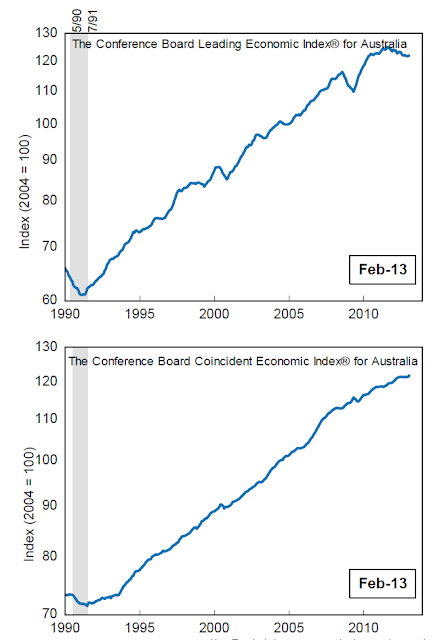 First, remember that I'm bearish on the Australian economy as I've noted several times (see this link). The big reason is they're dependent on Chinese growth for most of their growth. So as China rebalances their economy, Australia should see a decrease in growth. Australia's central issue -- as with China -- is a need to diversify their overall economy. Over the last 10 years, Australia's primary economic growth has come from exporting raw materials to China. But as China has slowly started to move their growth model to one that is more driven by internal demand, raw material exporters like Australia have to change their respective growth models. But turning an economy in a different direction is a bit more difficult than you'd think, hence my bearishness on Australia. There are a few more data points from Australia over the last few weeks that should be highlighted. The trend estimate rose 0.4% in March 2013. This follows a rise of 0.4% in February 2013 and a rise of 0.4% in January 2013. The seasonally adjusted estimate fell 0.4% in March 2013. This follows a rise of 1.3% in February 2013 and a rise of 1.3% in January 2013. In trend terms, Australian turnover rose 3.3% in March 2013 compared with March 2012. The following industries rose in trend terms in March 2013: Food retailing (0.5%), Household goods retailing (0.6%), Cafes, restaurants and takeaway food services (0.4%), Other retailing (0.3%), Department stores (0.4%) and Clothing, footwear and personal accessory retailing (0.1%). The following states and territories rose in trend terms in March 2013: New South Wales (0.5%), Queensland (0.6%), Victoria (0.4%), Western Australia (0.2%), the Australian Capital Territory (0.7%), Tasmania (0.5%) and the Northern Territory (0.2%). South Australia (0.0%) was relatively unchanged in trend terms in March 2013. Overall, we see an decent increase over the last few months in this metric. The trend estimate for total dwellings approved fell 1.2% in March and has fallen for three months. The seasonally adjusted estimate for total dwellings approved fell 5.5% in March following a rise of 3.0% in the previous month. The Conference Board LEI for Australia increased again in February for the second consecutive month, with rural goods exports and stock prices making the largest positive contributions to the index. The leading economic index has been flat over the six months between August 2012 and February 2013, an improvement over its decline of 1.1 percent (about a -2.3 percent annual rate) during the previous six months. Additionally, the strengths and weaknesses among the leading indicators have become balanced in the last six months. The Conference Board CEI for Australia, a measure of current economic activity, also increased in February. In the six-month period ending February 2013, the coincident economic index increased by 0.5 percent (about a 1.0 percent annual rate), down from the 0.9 percent increase (about a 1.8 percent annual rate) for the previous six months. Nevertheless, the strengths and weaknesses among the coincident indicators have been fairly balanced in recent months. Meanwhile, real GDP increased at a 2.4 percent annual rate in the fourth quarter of 2012, slightly down from the 2.6 percent (annual rate) in the third quarter of the year. The LEI for Australia increased again in February, and its six-month change emerged from negative territory for the first time in more than a year. Meanwhile, the CEI also increased in February, and its six-month grow rate has improved somewhat from the second half of last year. Taken together, the recent improvement in both the LEI and CEI and their components suggests that the economy should continue to grow at a steady pace. The overall trend in the LEIs is still down. The coincident indicators have been level for a bit with only the recent increase to show economic expansion. And finally notice that while the overall uptrend of the Australian ETF is still intact, the market has not been making new highs with the rest of the world. The fact that the bank lowered rates indicates they're concerned about the economy's growth prospects enough to continue goosing growth forward. That should tell us a great deal about the future. And while we've seen some positive numbers (retail sales and the LEIs), I still think that the need to rebalance their economy from raw materials to consumer led growth will be more difficult than they anticipate. I keep harping on the oil choke collar because it is something that is always going on, at least in the background. We certainly continue to have major and ongoing problems with average consumer households being worse off than they were 15 years ago, with the continuing need for households to deleverage, and with virtually all of the productivity gains in the economy going to corporate suppliers and not being shared with workers at all. But the constriction of sharply elevated energy prices is another long term negative trend. Here are a couple of graphs to remind you just how negative it has been. You can see that the price of gasoline had a similar trajectory on both occasions, rising to about 4 times its original cost, in about 7 years in the 1970's, and in about 9 years at the turn of the Millenium. The impact of gasoline prices on the average wage earner was even more drastic in the run-up last decade than it was in the dismal 1970's. And that impact has continued at a level even worse than the 1970's right up until the present. Ultimately OPEC lost control of the market in 1986. While I am confident that the oil choke collar will loosen, I doubt we'll ever get back to the levels of the 1990's. More likely substitute sources of energy will continue to make inroads. And I can't at all be sure whether the decline in prices we've seen this spring heralds a secular change or is just a brief respite. 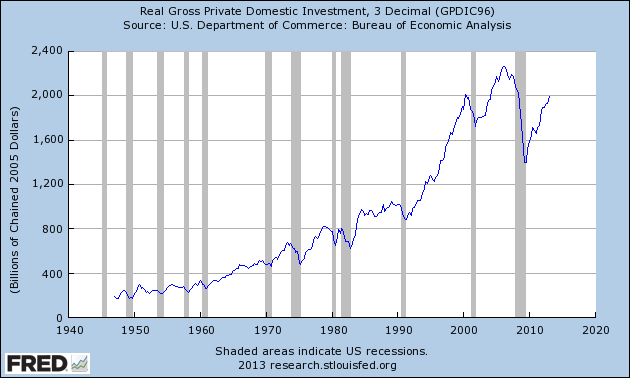 Let's now turn to US gross private investment, another component of the GDP equation. Total investment peaked at high levels before the last recession, only to drop substantially during the recession. Since then, we see a strong uptrend, with total investment now at the level of the peak from the 1990s expansion. It should come as no surprise that residential investment has cratered after the housing bubble, falling from a little under $800 billion to a little above $300 billion. 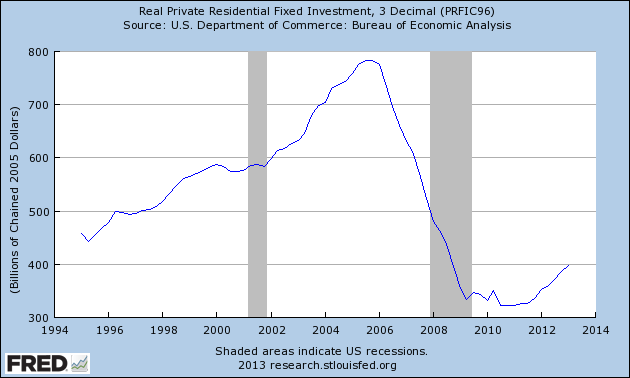 Also note that the overall trend of residential investment has been rising for about a year now. In contrast, we see that non-residential investment is actually doing very well. It has been consistently rising for nearly three years and is almost at levels seen at the peak of the last expansion. And finally, also note that equipment and software investment is now higher than it was at the end of the last recession. This area of investment has also been growing solidly for the last three years. With the exception of the residential investment situation, overall investment has bounced back to fairly decent levels. 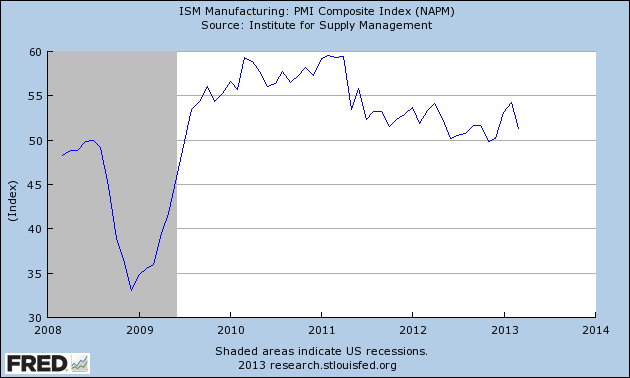 Overall, the ISM index has been above the 50 mark for over three years, with the exception of a few data points. 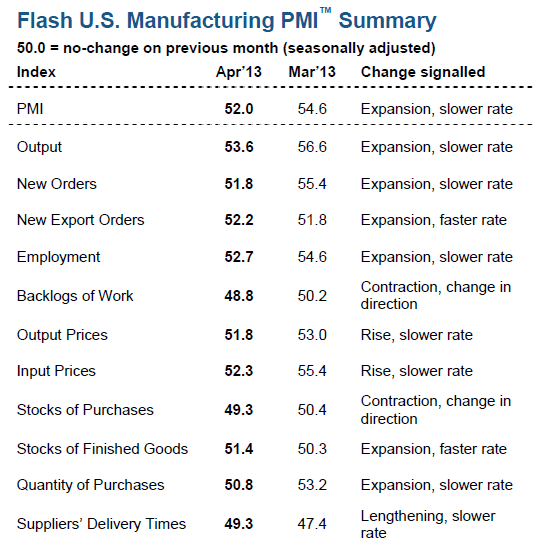 Put another way, manufacturing has been doing well for a majority of the expansion. With the exception of a few dips, the new orders index has also been showing expansion for about three and a half years. 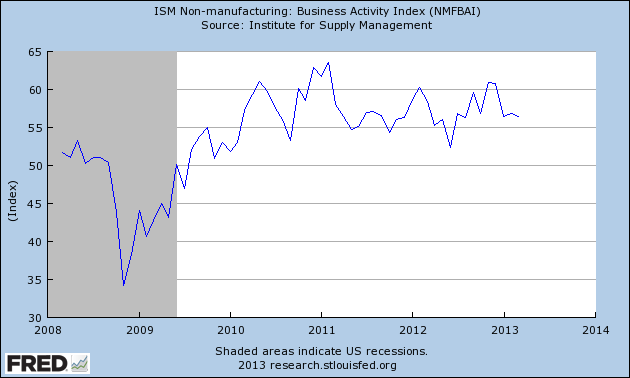 And the overall business activity index has been strong as well, printing between 55 and 60 for over three years. The quotes are a mixed bag. Some sectors are hurting (defense, oil and gas, computer and electronics, chemical products), while others are doing a bit better (food and beverage and furniture and related products). However, the report also noted that 14 of 18 industries reporting were expanding. Overall, all the major categories are still in positive territory; we need to see a few more months of data before we can confirm that the trend is dropping into negative territory. 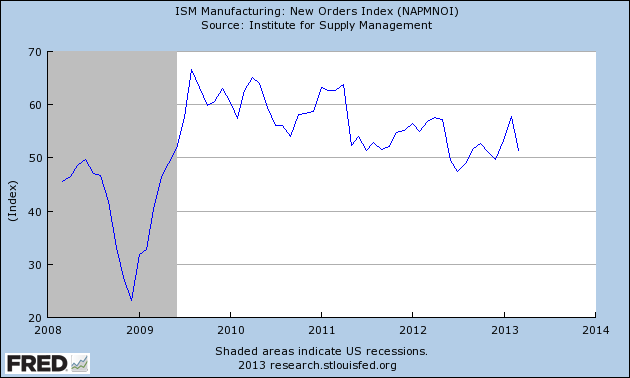 The bottom line is the manufacturing sector is still expanding. There may be some clouds on the horizon according to the Market report, but we definitely need more data to make that call official. Experts say that inability to fit into either world is a common predicament for immigrants who came here as teens, though many of them eventually adapt much more successfully than Tamerlan Tsarnaev did. The most interesting results are the ones you don't expect to find, the ones that contradict your beliefs going in (Doomers really ought to give it a try sometime, as opposed to just searching for graphs that point down). Over the weekend, I decided to update my scattergraph comparing firing (via initial claims) vs. hiring (via nonfarm payrolls) to see if the relative weakness in job numbers compared with initial claims that started a year ago has persisted. The answer is, it has. As you can see, the data points moved to the left and have remained there. That tells us that for any given level of firings, we've had less hiring in the last year. That was the result I expected. But the surprise happened when I decided to compare the current recovery with the recoveries from the 3 previous recessions. I fully expected to find that for a given level of layoffs, there was more hiring in the previous recoveries, especially as layoffs declined under about 400,000. But that wasn't what I found at all. The below scattergraphs compare the current recovery (blue), measured from the level when layoffs first declined to about 480,000 to the present monthly average of about 340,000, with each of the past three recoveries (red) during the period of time when layoffs were in the similarly declining 480,000 to 340,000 (or slightly less) range. Since the monthly data is noisy, there is a second graph for each recovery, totalled on a quarter to quarter rather than month to month basis, the better to show the comparison (Remember, for any given level of layoffs, left is weaker hiring, right is stronger hiring). For any given level of layoffs, hiring has consistently been better during the current recovery than during the economic expansion 10 years ago. In the current recovery hiring has also been equal to or better than hiring during the early part of the 1990's expansion. Only when layoffs declined to a level slightly below our current level did hiring really take off in the 1990's. Only during the first two years of the 1980's expansion was hiring for any given level of layoffs better than it has been during this recovery. After that the levels were about the same. In October 1982, initial jobless claims peaked at nearly 700,000. They were down to 333,000 27 months later. In March 1991, initial jobless claims peaked at just over 500,000. They were down to 313,000 21 months later. In September 2001 just after the terrorist attacks, initial jobless claims peaked at 517,000. They were under 400,000 only 9 months later, and were down to 335,000 43 months later. By contrast, during the great recession initial jobless claims peaked at 670,000 in March 2009. It took 30 months before they declined to under 400,000, and they finally were down to 334,000 48 months later. So the real story of the relatively poor payroll growth during this recovery hasn't been a dearth of hiring. Rather it has been the very long tail of elevated if slowly declining firing, that appears finally to have run its course. So, what explains more vacancies at given unemployment levels...? The answer almost certainly involves employers, not workers. Businesses have become more risk-averse. They’re more reluctant to hire. The nice thing about doing raw research and relying on hard data is that I can say beyond reasonable doubt that as to his wankery today, Robert Samuelson is a complete jackass. One of the many ranting points I see on progressive blogs is against "the top 20%" who are apparently presumed to be the functional equivalent of Jamie Dimon. Not so. Many of "the top 20%," in terms of wealth as opposed to income, are also known as "mom and dad." If you look at the Census Bureau's breakdown of average wealth by age group, the most prosperous are those on the verge of retirement. They've had 30 or 40 years to gradually build up savings. For example, a couple who each have $50,000 jobs (in today's dollars) and live frugally by spending half of their net earnings and saving the other half (roughly giving them $30,000 savings per year) will become millionaires in about 25 years (thanks to compounding and return on investments). Obviously this isn't the majority - the median wealth of people in the 55 - 64 cohort is something like $200,000 - but a non-trivial percentage of middle class workers ultimately reach this milestone. And you know what they would like to do more than anythings else? Retire! I know this not only from personal conversations with my fellow fossils, but also through a discussion with an accountant recently in which he told me that the number one reason most of his older clients haven't retired yet is because they are afraid to before they are eligible for Medicare. Or they have to continue to work after age 65 themselves because they need their health insurance to cover their spouse until their spouse reaches age 65. Meanwhile, people like David Leonhardt in the New York Times are writing about Today's Idled Youth," describing how the ongoing Hard Times have hit the young perhaps harder than any other group. They bought into the American Dream of studying for a degree, becoming a professional of some sort, and hoping for a decent middle class existence. Instead, they are taking clerical or entry level service jobs, or even worse, unable to find a job. You can see where I'm going with this now, right? Here we have the older workers, hobbling to the finish line, but unable to end the race. And here we have young workers, itching to get started, and they can't because there are no jobs, or no middle class jobs, for them. And the one thing that would cause the many older workers who have saved for retirement to be able to leave the workfoce, and clear the way for those frustrated younger workers, is guaranteed medical care. Fortunately, we have a program that provides exactly that: it's called Medicare, and according to those already on it, it works really really well. And it works at much lower administrative costs than for-profit private coverage (If I recall correctly, Medicare's administrative costs are something like 3%, vs. 15% for for-profit plans)(UPDATE: According to the CBO, Medicare's administrative costs are 2%, vs. 17% for for-profit plans. And Medicare premiums have consistently risen less than private health insurer premiums) . And also unlike for-profit plans, in Medicare there's no incentive to deny coverage. 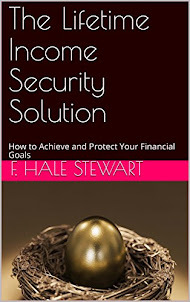 As in, yes you can buy into a private plan at age 60 for example, but it will be very expensive and you'd better pray they don't come up with an exclusion if a disease of age catches up with you. Atrios has written a number of times about increasing Social Security payments. Balderdash, say I. If you really and truly want to make a dent in the persistent employment problem facing younger workers, allow anyone age 55 or above to buy into Medicare. Charge them annual premiums equal to what they would have to pay into Medicare at their same wage or salary until age 65 if they continued to work. You would be amazed to see how quickly Boomers can still move, cleaning out their offices and cubicles, when properly motivated. And then younger workers could move right in. It'll never happen, of course, because it smacks of the New Deal, not the "21st Century" privatized solutions Barack Obama has touted since 2009. And of course the GOP will never allow it, not just because it smacks of the New Deal, but because if Obama came out in favor of it, they would oppose it for the simple reason of opposing everything Obama wants. But that doesn't mean we shouldn't acknowledge that it is a real solution to a real problem, and collectively rub Washington's Very Serious People's noses in it.